The surface of the potentially Earth-like exoplanet Proxima b, as imagined by an artist. 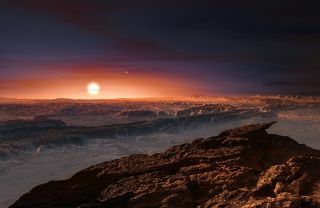 The discovery of a roughly Earth-size planet around Proxima Centauri, the nearest star to Earth, has generated a lot of buzz, and even speculation that a robotic probe may visit the world in the coming decades. But "Earth-size" is a very different thing than "Earth-like." Even though the newfound planet, known as Proxima b, appears to orbit in its star's habitable zone — the range of distances where water could exist in liquid form — nobody knows if it's actually capable of supporting life. Scientists know only a few things about Proxima b for sure, Barnes wrote — its distance from Proxima Centauri, its orbital period and its minimum mass. That information says that Proxima b completes one lap around its star every 11.2 days. This orbit might be roughly circular, or it could be very elliptical — nobody knows yet. Proxima Centauri b is at least as massive as Earth — but it could be heavier. "If the planet is much larger, it may be more like Neptune with a thick gaseous envelope," Barnes wrote. An encouraging sign is that only a small number of the possible orbits indicate a planet that is a gas giant, so it's likely to be rocky like Earth, he added. But researchers don't know for sure if the planet has an atmosphere, or whether that atmosphere (if present) could allow for liquid water to exist on Proxima b's surface. The planet's surface temperature is unknown, because it depends heavily on atmospheric characteristics.. The star poses other problems for prognosticators. Proxima Centauri, which lies 4.22 light-years from Earth, is a red dwarf just 0.1 percent as bright as the sun and harboring 12 percent the sun's mass. That means the "habitable zone" is 25 times closer in than the one surrounding our own sun. Planets that are close in tend to become tidally locked, always keeping the same face toward their star. Barnes noted that scientists once thought tidal locking didn't bode well for habitability; the star-facing side would be too hot for life, while the dark side would be too cold. But newer modeling work suggests that heat could be distributed more evenly via winds, making tidally locked worlds potentially habitable (if they have an atmosphere), he added. Red dwarfs also fire off powerful flares — which can destroy a planet's atmosphere and bathe it in harmful radiation — more often than sun-like stars do. A magnetic field would offer some protection from such stellar outbursts, but nobody knows whether or not Proxima b has one. For years, scientists thought that slowly rotating planets such as Proxima b could not support a strong magnetic field. "However, more recent research has shown that planetary magnetic fields are actually supported by convection, a process by which hot material at the center of the core rises, cools and then returns," Barnes wrote. "Rotation helps, but Dr. Peter Driscoll and I recently calculated that convection is more than sufficient to maintain a strong magnetic field for billions of years on a tidally locked and tidally heated planet. Thus, it is entirely possible that Proxima b has a strong magnetic field and can deflect flares." Another issue is water — specifically, how much of it Proxima b may have. This depends on the planet's history, Barnes wrote. If Proxima b formed relatively far away from the star (and later migrated inward to its present position), then it has a better chance of being ice-rich, ensuring a plentiful supply of water. But if the world formed closer in, much or all of its water may have been heated to vapor and lost. Or the planet could have formed with lots of water, lost it, and then had more delivered to it by comets and/or asteroids, as the Earth did. It is not at all clear which is true. "It is entirely possible that this planet has water, but we cannot be certain," Barnes wrote. So, what's the bottom line? Is Proxima Centauri b habitable or not?